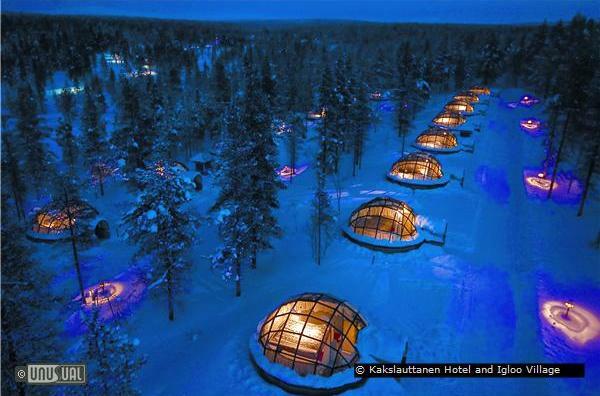 Hotel Kakslauttanen is the home of the famous Igloo Village with the unique Glass and Snow Igloos and the World's largest snow restaurant. 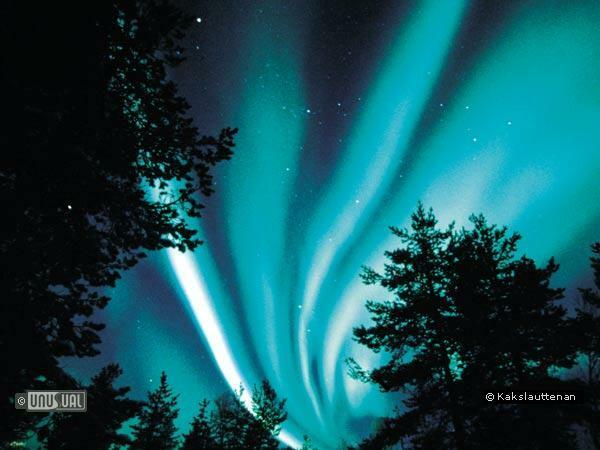 In addition guests can enjoy all the other Lappish winter activities including the Northern Lights (Aurora borealis) visible generally from late August to late April. 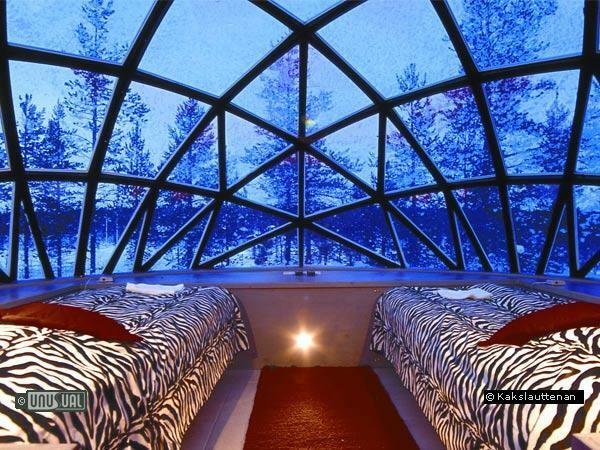 Surrounded by Lapland's exotic and stunning scenery, not only can guests sample the peace of sleeping in snow (the snow muffles sound, and provides a great night's sleep), the glass igloos are fantastic for lying on your bed at night, watching the Northern Lights in the warm. 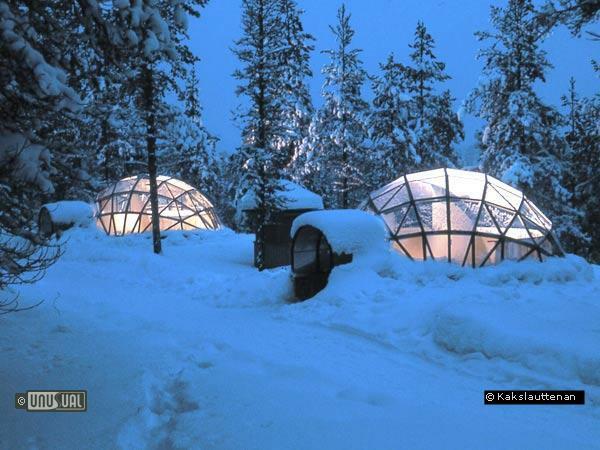 Igloo living with both snow and glass igloos available, offering cold or warm night sleep as required. 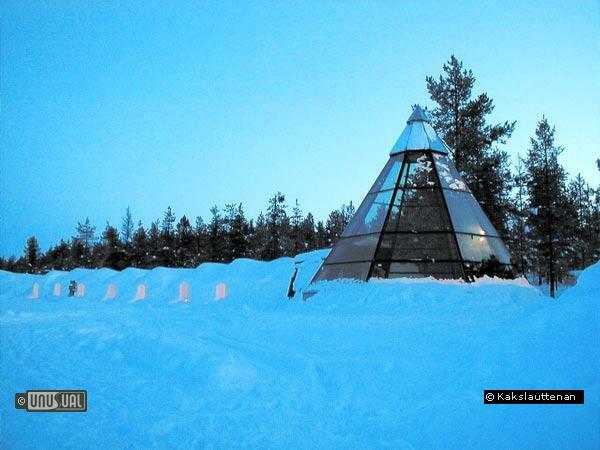 Hotel & Igloo Village Kakslauttanen offers 31 first-class log cabins, 20 fantastic glass kota igloos and their igloo hotel rooms. 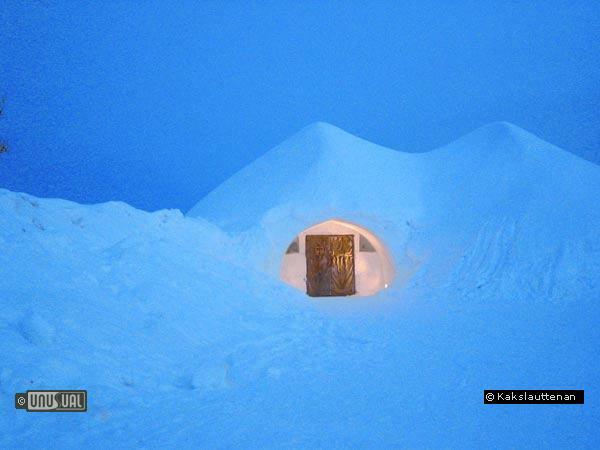 Imagine you sleeping in an Igloo made of Snow. It is totally quiet. Lights inside ice illuminate the Igloo. These make the atmosphere so exciting that never get bored of marveling it, until you fall to deep, comfortable sleep in your warm down sleeping bag. The Snow Restaurant is fully equipped with a kitchen and it can offer full three course dinners or lunches in a very special environment. The restaurant is inside a huge Snow Igloo and it is equipped with a seating capacity of 150 person in a tables made of crystal clear ice. The Snow Restaurant will be built every year and it is open from December till May. 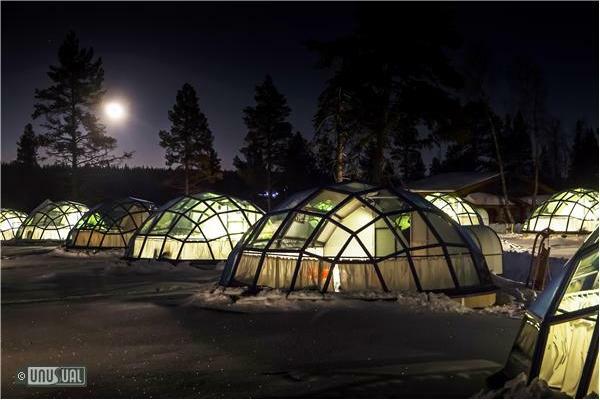 We are the proud owners of the World's Largest Smoke Sauna beautifully situated by the icy pond overlooking the Igloo Village with room for over 100 persons in two separate saunas. Also ice swimming. In addition to the big Smoke Saunas, every cabin of the Hotel Kakslauttanen is equipped with a sauna. The closest airport is Ivalo Airport, about 40 km (25 miles) away. The hotel can arrange car or snowmobile transfers. For reference, Helsinki is 1,058 km (674 miles) away and the nearest ATM is in Saariselka village, 10 km (6 miles) away. 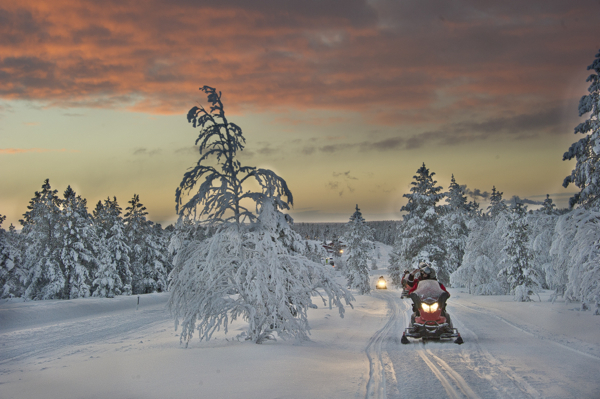 While some people will be happy to marvel at the amazing scenary, there are facilities for dog sledding, husky rides and snowmobile adventures. Under the ice, the water of the frozen lake or sea always stays over the freezing temperature. This is nature's smart way keeping the flora and fauna in the water alive even in the winter. In Lapland people have taken advantage of this since the times began. There is nothing more relaxing than to dip to a little hole in the ice. It has been proven that this immersion has a healthy effect on your body. Hello - just a note of advice regarding your punctuation. You have put an apostrophe in a word which is a plural: 'igloo's' should be 'igloos'. Kind regards, A Year 7 class. We travelled all the way across the world from Australia to Finland Lapland for our honeymoon. It was the best experience of our lives, Hotel Kakslauttanen was fantastic, the friendly staff girl at the hotel made sure we had a warm and romantic stay and she put us up in the honeymoon suite log cabin which was beautiful. 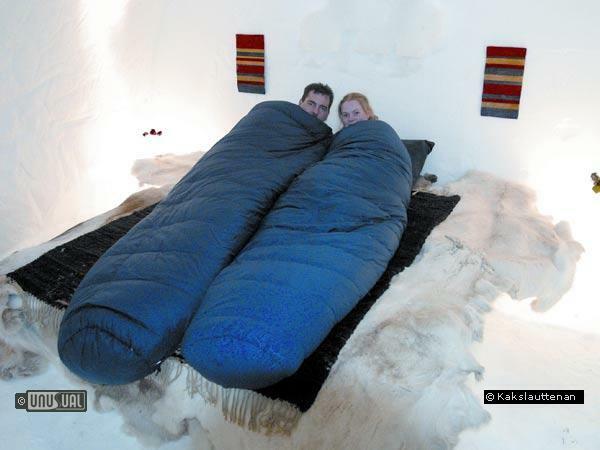 We seen the Northern Lights at there best and stayed a night in an igloo which was lovely and cosy. We loved the 3 hr husky mushing adventure through the National Forests of lapland. We swear to return again to re-live it all again one day as we had such a fantastic holiday in Finland. its realy great!.... one of the best places i've ever been..... nice..
"We were married here in April within the Ice Chapel. It was an amazing fairytale experience. The accomodation was great, the food fantastic and the staff were very helpfull and friendly. 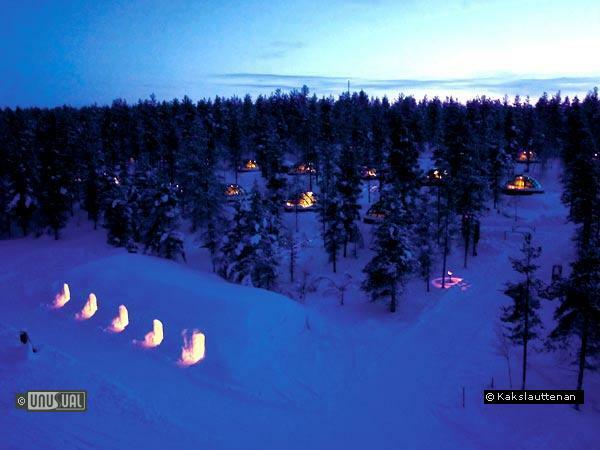 We would recommend Kakslauttanen Hotel and Igloo Village to anyone who loves the snow and the great outdoors. We enjoyed it so much, we are already planning our next visit. We stayed here in February - it was magic. -30 outside but a toasty 23 inside. We saw the northern lights 2 nights running and my eyes were tired from looking straight into the night sky from a very Austin Powers bed to watch just one more shooting star. Fabulous.